As a family-owned and operated business in the Lehigh Valley, Pennsylvania Lawn & Landscape believes each client is an extension of that family. From the first phone call, through the consultation process, to the completion of your project, you're treated like family. For over twenty years, our business has thrived as a result of quality landscaping and hardscaping and this success has enabled us to expand our business into Holiday Decorating. Pennsylvania Lawn and Landscape has won countless awards for their outstanding job performance. We have won best display in the Spring Home show at Stabler Arena 5 years in a row. We have won best tree lighting and best bang for the buck a number of times. We take great pride in our work and give you nothing but the best! The Landscape division perfects the look of your backyard from walkways, to fireplaces, to patios, etc. Refresh the feeling of the outside with wonderful plants and trees, add the sound of water with a sparkling pond. PA Lawn and Landscape can design and install your new feature to your house! Is your driveway cracked and has bumps? Redo your driveway with hand picked pavers that do not crack or has bumps. Not only will your driveway look amazing but it will last a very long time. To add a touch of glamour to your house just call Pennsylvania Lawn and Landscape and we will design and install your addition with maximum quality and affordable prices all year round!! Spice up your outside with custom made stairs. Nothing is more elegant than having a stone stairway to come home to. 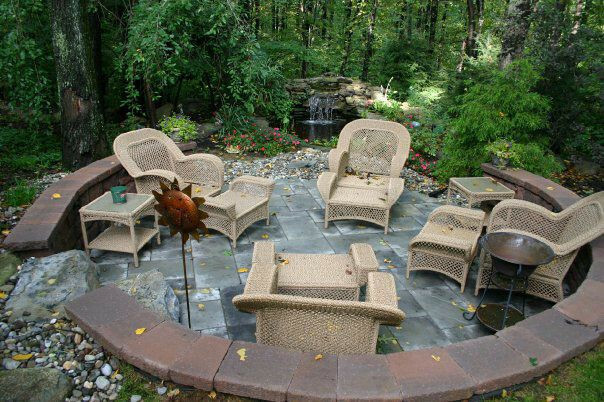 All our patios can be laid out in a variety of arrangements such as "Random" and "Elegant." It's beauty will be surpassed through the use of a blend of stone colors. From patios to walkways built in there natural surroundings, we work with the site and natures intent. Our construction looks like it belongs there. The glamorous look of built in grills and custom bars are just the touch that you can have to put the finishing touch on your deck or patio. You can also throw a party and 'wow' your guest with your custom built bar. Using proper color and shading of brick and stone to complement your residence are important considerations. We take the texture and shape of material into account so they provide a natural look to your beautiful home. Sitting at night by your newly installed fireplace is the coziest feeling you can ask for. That crackle in the air and the aroma of the campfire is exhilarating. During the day you can relax next to the pond, while listening to the rhythm of the fall. Full Commercial/Residential maintenance from lawn mowing, trimming and blowing to tree and shrub pruning. We take care of any outdoor service to keep your place looking great.